BigDawsTV’s Daring Diamond Heist Prank! 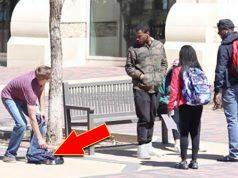 You’ll see plenty of fun and crazy pranks here at Pranksters that are worth a watch. Silly little tricks and stunts that’ll make you laugh. But sometimes we yearn for a wider scale and more elaborate practical joke. And our prayers have been answered here as BigDawsTV comes up trumps with his hugely elaborate ‘Diamond Heist Prank’. There’s a real narrative in this one too. We start with the actual robbery itself and then move on to the fencing of the diamonds, all the while – of course – members of the public are privy to the action and it’s all about their reactions. How do people react to being there during some pretty major crimes? Find out! Next article‘Old Man Mask’ Dance Scare Prank! How Will People React When A THIEF Steals From A Bag Right In Front Of Them? Seriously, Are These The Worst Parents Ever? Nerd Freestyle Raps In Compton!